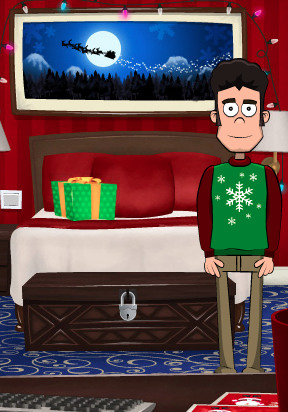 Jerry of Jerry's Merry Christmas, today's point-and-click adventure from Carmel Games, really gets into the holidays. His house is fully decorated for Christmas, and he even broke out the green snowflake sweater. The only thing that's missing is a piece of mistletoe hanging on the wall, and he's going to need your help with that one. The whole thing is mouse-controlled (except for one part that uses the keyboard): click around, pick up inventory items and use them, and eventually collect everything Jerry needs to finish his task. This has everything that makes a Carmel Game a Carmel Game: a stylish mix of flat-colored and shaded graphics, puzzles that are mostly logical but with one or two trip-ups, a few humorous surprises, and a changing cursor to reduce troublesome pixel-hunting. Relatively new is the possibility of dying a painful death by taking a poorly reasoned course of action, but the game is kind enough to provide you with an "undo" button to combat that happenstance. It is much shorter than most of Carmel's work (The Proposal and Vortex Point: Far Journeys come to mind), but perhaps that's a good thing; this developer's work seems to be better in small packages. But we've been keeping Jerry waiting for long enough; it's time to get into the Christmas mood! Jerry's Merry Christmas Walkthrough now available! You'll start in the Living Room. Note the X on the wall to the right; that's where we'll be hanging the mistletoe. Also note the present on the floor near it. Go to the left to reach the Bedroom. Take the green present from the bed and the book from the nightstand to the left. Also, click on the nightstand's drawers to get a key. Click on the book in your inventory. You need the mistletoe itself, two nails, a hammer, and a wall hanger. Should be easy to come by. Go to the left again and you'll be in the Bathroom. Take the credit card from the floor, and check the cabinet for a plunger. Open the toilet lid, then use the plunger on it. An elf will give you a hammer. Return to the Bedroom. The chest at the foot of the bed is locked? Good thing you've got a key, then. Use the key on the chest to get some nuclear waste. Wait, what? Click on the computer in the foreground. Pick the mistletoe to buy it. When prompted for your credit card number, click the credit card in your inventory to find out what it is. After placing your order, return to the Living Room, then click the door in the background to go Outside. Click the mailbox to get the mistletoe you were looking for. Click the rabbit hole (just below the mailbox) and a rabbit will pop out. It's hungry. Grab the carrot from the snowman on the left and give it to the rabbit, and you'll get a hook in exchange. Return to the Living Room, then go right to reach the Kitchen. Check the two leftmost cabinets below the kitchen counter for an aluminum cup and a glass bowl. Open the window, then use the aluminum cup on it to get a cup full of snow. If you could melt it down, you'd have water. Do NOT put the cup of snow in the microwave! If you do, the results will be both painful and expensive (and hilarious, but it's two against one). Combine the cup of snow with the glass bowl to transfer the snow. Open the microwave, then put the bowl of snow in it to melt it down. You now have a bowl full of water. Use the water on the bamboo plant in the foreground. Hmm... nothing? Maybe it needs some special fertilizer. Use the nuclear waste on the bamboo plant, then apply the water again. Wow! Take the nails that fall down. Now you have everything you need to hang up your mistletoe. Return to the Living Room. Put the green present on the red one, then click on the present stack to climb on top of it. Click the X on the wall to put everything up. Watch the ending. Thanks to SonicLover for the walkthrough! Pedant alert! That's not mistletoe! but no hanger? Any help? We'll have a walkthrough up later.